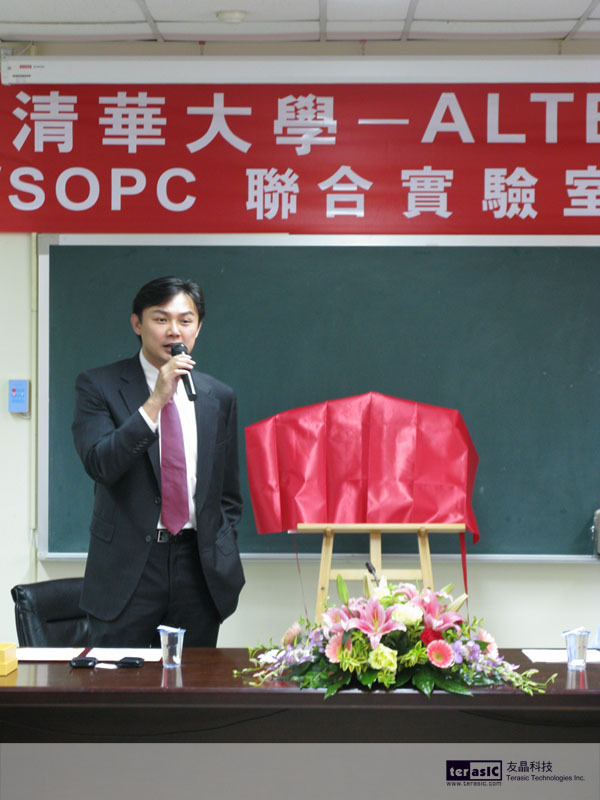 National Tsing Hua University-Altera EDA/SOPC Joint Lab was established on Aug 17th, 2010. The Altera Joint Lab in National Tsing Hua University (NTHU) is equipped with 80 sets of tPad All-in-One FPGA Development Platform. tPad features the latest DE2-115 Cyclone IV FPGA Development Platform with an 8 inch Touch Panel and a 5 Mega Pixel CMOS Camera. The most up-to-date software, along with the tPad, was donated to the students and professors as free teaching materials. The Altera Joint Lab will speed up the study of EDA/SOPC in NTHU. 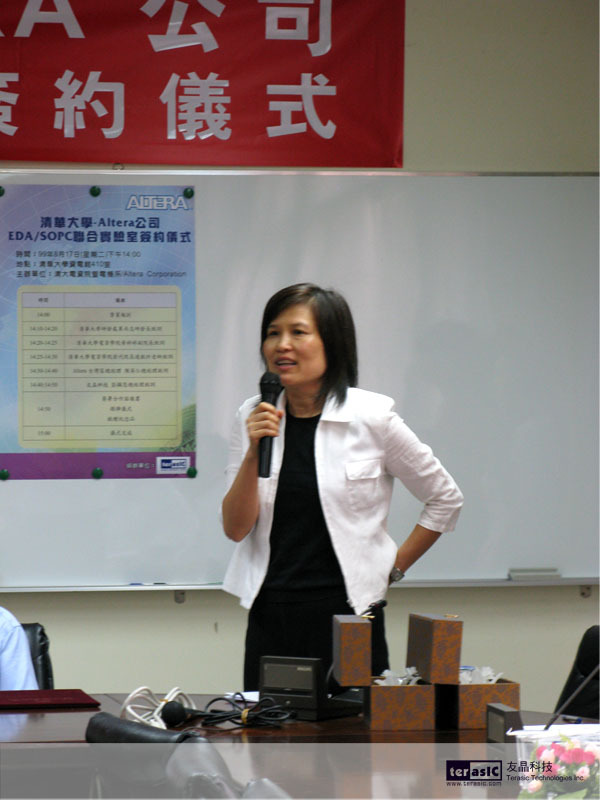 Ying Chen, General Manager of Altera Taiwan noted, “Besides donating the high-end FPGA platforms, over 30 years of free license for Quartus II and Nios II development softwares are offered as well. We wish that NTHU will be the leading research institute for FPGAs, and compete head to head with other renowned universities in the world.” The total donation amount reached over NTD 3 billion. 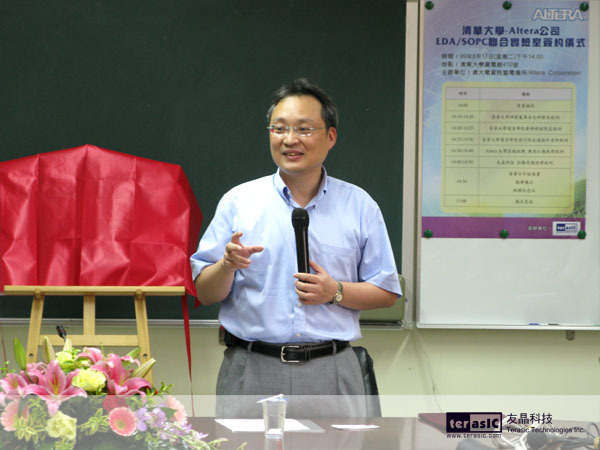 Terasic CEO, Sean Peng commented, “Terasic Technologies will always be supporting with both hardware and software to assist further teaching and researching. It’s our pleasure to see how students can prosper with our help.” The establishment of Altera Joint Lab signifies the interconnection of academia and industry. The College of Electrical Engineering and Computer Science (EECS) of NTHU was established on February 1, 1998. 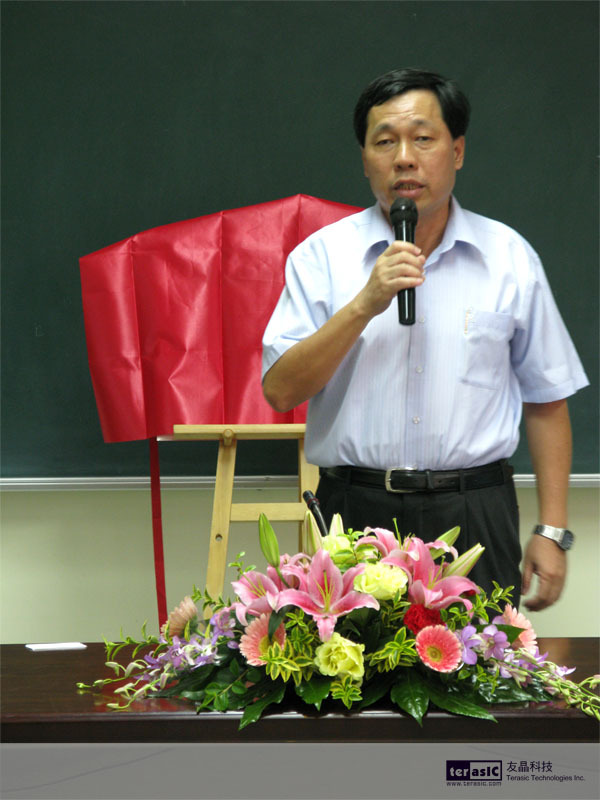 The faculty includes one Academia Sinica fellow, seven IEEE Fellows, and two IEEE Technical Achievement Award winners. There are also winners of Outstanding Research Awards issued by National Science Council. The college has been fostering high-tech professionals. Students are expected to be the talent pool of the industry. There is not only close collaboration between the college and the high-tech industry; the advanced lab resources make the research outstanding. Building Altera Joint Lab enriches the research resources, as well as enabling students to have hands-on experience with the FPGA industry’s latest products. Altera Corporation, popularizing FPGA DE series boards in academia for years, has nurtured a huge group of digital IC design talents around the globe. Over 100,000 FPGA development platforms were shipped till Aug, 2010. Behind the success story, Terasic Technologies produced all the DE series FPGA development platforms for more than 1,000 universities in the world. Terasic Technologies is the University Program partner with Altera and enjoys a steady and good relationship. In harsh economic times, it is more challenging for college graduates to secure a job. Exploring more in the EDA/SOPC field definitely helps students to become potential employees. 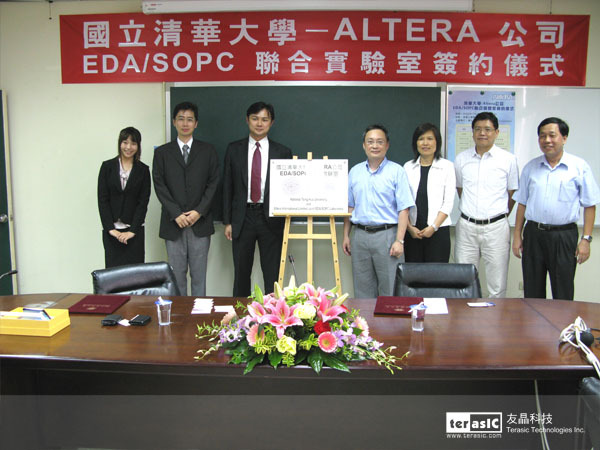 Terasic Technologies provides instant and strong support to Altera Joint Labs in Taiwan. Top students in top universities familiarize themselves with Altera FPGA development platforms as the success story continues. The contract was signed at 2pm, Aug 17th in NTHU, EECS College building, Conference Room 410. 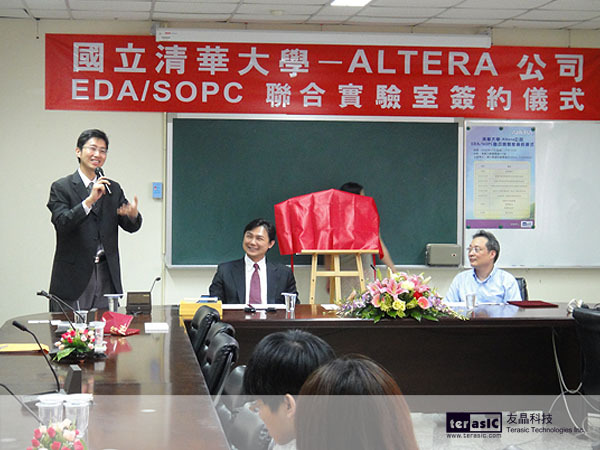 From right to left: former Acting Dean of EECS College Chen-Hsin Lien, EECS Director Chi-Chao Chao, Deputy Dean of EECS College Ting-Ting Huang, Dean of NTHU R&D Office Shang-Jr Gwo, General Manager of Altera Taiwan, Ying Chen, CEO of Terasic Technologies, Sean Peng and Terasic University Program Manager Sunny Yen. 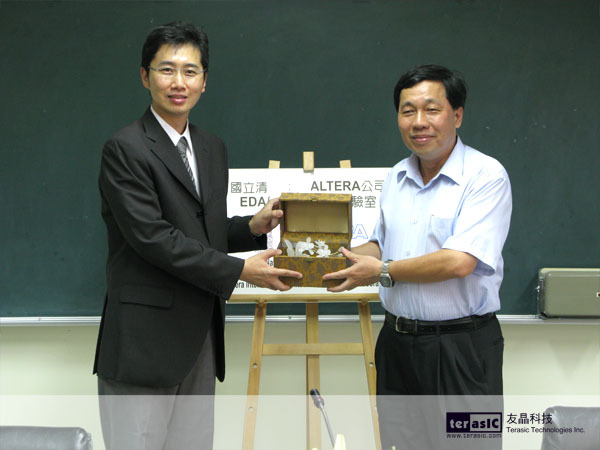 NTHU Deputy Dean of EECS College Ting-Ting Huang (right), and General Manager of Altera Taiwan, Ying Chen (left), exchanged gifts. NTHU Former Acting Dean of EECS College Chen-Hsin Lien (right), and CEO of Terasic Technologies, Sean Peng (left), exchanged gifts.